The impact of fraud, waste and abuse on payers, whether insurance companies, government agencies, or self-insured employers, is enormous. The time is right for health payers to invest in technology to prevent claims fraud and abuse and stem the current epidemic of financial losses. 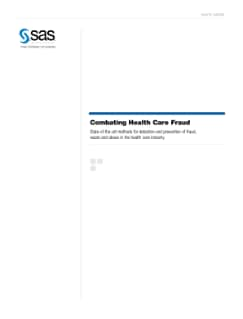 This white paper discusses how technology-based tools to fight insurance fraud can be used individually or in combination to help companies detect and prevent abusive or criminal claim activities and how fraud-detection techniques can be powerful deterrents for would-be fraudsters who seek to profit at the expense of insurance companies and their honest business partners and customers.